Digital HD was released on Oct 13 so is available now and the physical Blu-Ray DVD will be released Nov 3rd. 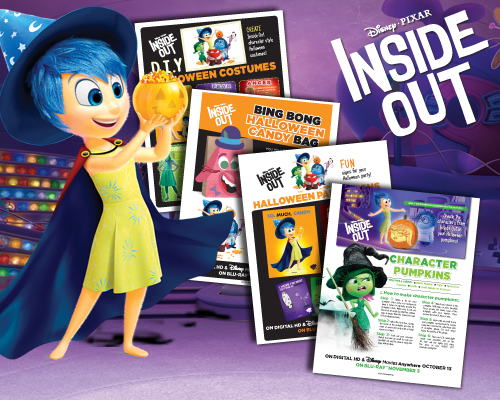 If you've seen the movie then you're going to love all these awesome activity sheets. There's something for everyone here and if you're having a fabulous Inside Out Halloween party and need some party signs then you must grab these awesome signs and these character faces for your pumpkins. And if you want to create your own Bing Bong Halloween candy bag then try this out. With a party you must have food and nothing makes a party like pizza and cupcakes. You must try Anger's Real Pizza and some delicious red velvet Anger Control cupcakes, they look delicious! If you're looking for some great costume ideas you gotta check these out, they look like so much fun. Your going to love these great games for your little ones. Ok, so I've given you LOTS recipes, crafts and activity sheets for your Inside Out Halloween or family night party. I hope you enjoy them all and let me know how the pizza and cupcakes turn out.